SourcePoint’s new passenger bus will help bring groups of Delaware County seniors to participate in programs at its facility, 800 Cheshire Road in Delaware, and take its enrichment center members to activities throughout the state. Pictured, left to right, in front of SourcePoint and the new, wheelchair-accessible bus are Gretchen Roberts, director of nursing at OhioHealth Dublin Methodist Hospital and a member of the SourcePoint Board of Directors; Bob Horrocks, SourcePoint’s executive director; Marlene Casini, president and CEO of the Delaware County Foundation; Stephanie Steinbeck, SourcePoint’s community programs director; and Steve Gorman, SourcePoint’s enrichment center administrator. SourcePoint has acquired a new 14-passenger bus to improve and expand services to older adults in Delaware County thanks to grants provided by the Mid-Ohio Regional Planning Commission (MORPC) and the Delaware County Foundation. The new, wheelchair-accessible vehicle will be used to convey SourcePoint’s enrichment center members to activities outside its facility and members of the community to programs at SourcePoint. The total cost of the vehicle was just over $57,000, with the MORPC grant providing 80 percent of the vehicle’s funding, and the Delaware County Foundation giving $16,000 to cover the 20 percent match and initial operating costs. 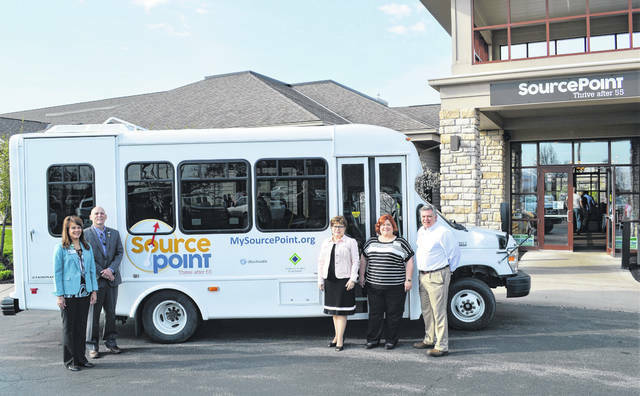 In addition to providing needed transportation for member programs and to bring senior groups to SourcePoint, the bus will help promote socialization of participants. According to U.S. Department of Health and Human Services research shows that forming small social networks is critical to maintaining an older adult’s cognitive capacity and sense of independence, which in turn improves their emotional well-being and quality of life. https://www.delgazette.com/wp-content/uploads/sites/40/2018/05/web1_Van-1.jpgSourcePoint’s new passenger bus will help bring groups of Delaware County seniors to participate in programs at its facility, 800 Cheshire Road in Delaware, and take its enrichment center members to activities throughout the state. Pictured, left to right, in front of SourcePoint and the new, wheelchair-accessible bus are Gretchen Roberts, director of nursing at OhioHealth Dublin Methodist Hospital and a member of the SourcePoint Board of Directors; Bob Horrocks, SourcePoint’s executive director; Marlene Casini, president and CEO of the Delaware County Foundation; Stephanie Steinbeck, SourcePoint’s community programs director; and Steve Gorman, SourcePoint’s enrichment center administrator.